Pete – who has worked with many great international names over the years – was immediately impressed with Emily when she was introduced to him when she was 14, by her parents. She had not worked with professional musicians before but soon showed the studio band that she was more than capable, with an innate sense of rhythm and syncopation, perfect melodic control and first class harmonies. Emily has provided backing vocals for Thunderclap on their previous tour and also had her own featured spot. On stage she confidently draws the eye, and exudes an air of professional competence way beyond her years. Emily-Jane (right) with students Eva-Jean and Andy. left…Emily-Jane in the studio with Mick Bigham and Pete Goodall of Thunderclap. 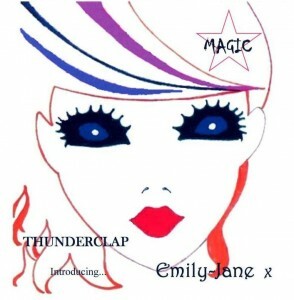 MAGIC – the release from ‘Thunderclap – introducing… Emily-Jane’, is available to download from iTunes. Consisting of 10 tracks, the album – which has been mainly co-written by Emily-Jane and Pete Goodall showcases Emily’s amazing versatility.